Twenty years ago, a fuel-guzzling motor was the pride of any driveway. In the 21st Century, however, these cars are becoming ever more an embarrassment to those who own them, with 3.0L engines attracting disapproving stares and judgemental glances from passersby. It's no secret that we need to be concerned about our impact on the environment, and so passing up a pollution-spewing 4x4 for a more sensible, energy efficient car may be the more sensible choice today. With all the options out there, though, how are we to navigate the jargon and choose the type of car best suited to our needs? Making clever use of technology invented for space travel, a solar car will typically have a roof and body panels armoured with photovoltaic cells. These cells are designed to convert energy from the sun into useful electrical energy which can stored in the car's batteries, and eventually used to power the car's electric motors. Silicon is often used in solar panels designed to be used in solar cars. Silicon photovoltaic cells have an efficiency of roughly 15-20%, and so the Great British sunshine may not pack the punch required to fully charge the car's batteries; for this reason, solar cars in this country may have be supplemented with mains power in order to keep the cells topped up. When fully charged, the batteries will allow the car to travel for up to 250 miles at 60 mph, while driving in cities will obviously reduce this distance slightly. A potential problem with solar cars, though, is that much of the current technology is experimental, and so some time may be required for the technology to mature before these become a wise investment. Despite their relatively recent boom, the first hybrid cars were built as early as 1901 by Ferdinand Porsche, who designed the Lohner-Porsche Mixte Hybrid. The first recognisably modern hybrid car did not, however, become available until the introduction of the Japanese Toyota Prius in 1997. This marked the beginning of an exhilarating journey during which a raft of new technology would be spawned. A hybrid car in its current form includes an electric motor designed to operate when driving at speeds under 30 mph, and an internal combustion engine for travel at higher speeds. At speeds above 30 mph, the internal combustion engine drives an alternator which then charges the batteries required for the electric motors. While this works well for drivers who often commute between cities or districts, those who stay entirely within a city, and thus under 30 mph for the majority of the time, mains power may be required to supply the batteries with a full charge. There are some, though, who fear that in switching to a hybrid car they will sacrifice the power of an internal combustion engine. This is not the case, however, since electric motors are able to deliver much greater torque than an internal combustion engine, giving a hybrid car much more of a punch when it comes to making a sharp take off from the lights. Despite the compelling advantages posed by an electric or hybrid car over a car running on fuel, there are some among us who just can't part with the idea of an internal combustion engine revving under the bonnet. There's no reason to spring for a dirty, fuel-drinking model, though, when fuel efficient cars are now becoming the norm. 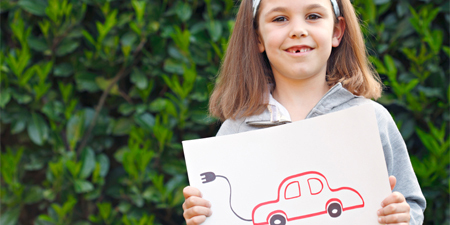 It's easy to see why a fuel efficient car is a much wiser investment than the older models. A fuel efficient car not only allows you to burn less fuel, but will also considerably lower your road tax. As well as the monetary savings, knowing that you're doing your part for the environment by driving a car boasting reduced emissions will see you repaid with something that it's difficult to put a value on. Eventually, tighter European regulations will make the current fleet of cars on the road obsolete due to their dirty emissions and over-indulgent fuel use, so why not get ahead of the pack and invest in an electric or fuel efficient car? Make sure to investigate all the green technology now at your fingertips before making a commitment to an older model of car. It is, of course, worth test driving each of the available green options before making a final decision, and you might just be pleasantly surprised at the driving experience in each of these cars. Why not explore your options today, and upgrade to a green car? You might just save some money, and you'll be doing your bit to look after the environment.